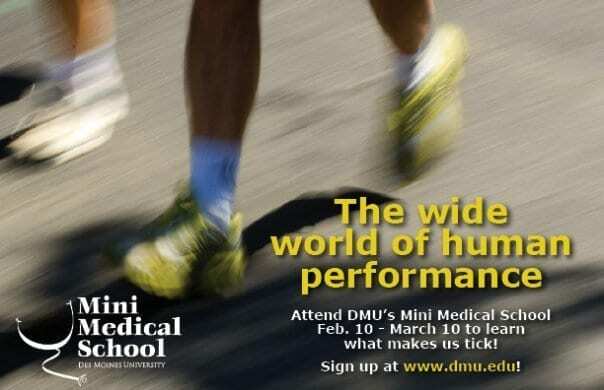 Mini Medical School is an awesome event at DMU. 5 Tuesday evenings, 5 topics, only $25! Plus it’s geared for a wide array of ages…middle school through senior citizens enjoy this annual event. (if you’re a middle, high or grad school student, it’s only $10!) Where else can you take five classes from med. school profs for $10 or $25!? Every year the series theme changes and this year it’s topics related to human performance. It starts a week from today on Feb. 10 at 7:30 p.m. You can sign up online or come a lil early & sign up at the door!